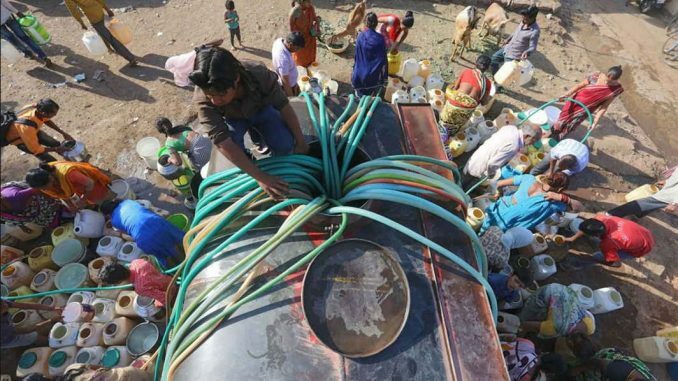 Sixty crore people in India face high to extreme water crisis and its demand is projected to be twice the availability supply by 2030, the Lok Sabha was informed. Answering a question in the Lok Sabha on a study conducted by the NITI Aayog on water crisis in the country, Minister of State for Drinking Water and Sanitation Ramesh Chandappa Jigajinagi said there was an imminent need to deepen understanding of water resources and their usage. “As per the latest report by the NITI Aayog on Composite Water Management Index, 60 crore population in India face high to extreme water stress,” he said. The country’s water demand is projected to be twice the availability supply by 2030, he said quoting the report. The minister said that his ministry through centrally sponsored scheme like the National Rural Drinking Water Programme (NRDWP) was providing technical and financial assistance to states for providing safe drinking water in rural areas. Adopting best practices related to groundwater management, efficient irrigationNSE -1.96 % management and rainwater harvesting measures would considerably help in mitigating the water crisis in future, he said.